Skeptical at first because of the price we each picked one up to add to our trail tools. The instructions boast that it will fill a 35" tire from 10 PSI to 35 PSI in six minutes. With my 33's I usually have it running on my A/T's for about 5 minutes each to get from 12 back up to 30. It doesn't baulk at doing all four in a row, but I've had the thermal cutoff switch kick in after doing about 7 Jeep tires without breaks. It may just be mine, but the guage is a little finicky. I've figure out what mark to go by on my tires so it's not a big deal. It's not a super awesome compressor, but was great for the money and I've been running it for about 3.5 years now with no problems or maintenance. It comes with a carry bag but after 2 or more tires forget about touching it to get back in its carry bag. I stuff it back in after I get home. Last edited by Skatchkins; 05-28-2013 at 01:09 PM. I have the same one. I picked it up from PepBoys on sale for $45.99. I went to Harbor Freight and replaced that air hose with a better quick connect hose and a locking air chuck. It's slow, but I was able to air back up all four of my tires. Went from 20PSI back to 37PSI. Didn't need a cool-down period. 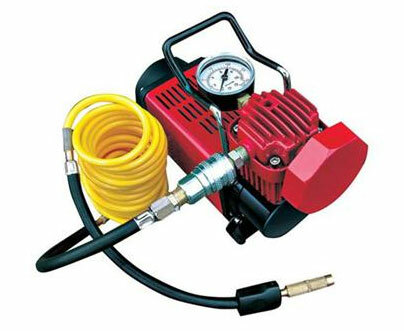 Where can I get a replacement hose for the MV-1050 air compressor? The connector to the tire pulled out of mine after 5 years use and I can't get it to stay in the hose so I need a replacement. Any ideas. Thanks for any help. I tossed the OEM hose on day one. I went to Harbor Freight and purchased a hose setup with quick disconnects. Mine died after 1 year of use. They work well but I upgraded last Christmas. Not that I actually wheel.